Skin Alert is Cairns’ tattoo removal professionals. Do you have a tattoo that you wish you never had done? Maybe you need to remove your tattoo for work reasons or even just to remove a reminder of the past. The reasons behind tattoo removal vary and thanks to our state of the art technology and latest advancements in laser tattoo removal, we can safely and effectively help you. Don’t just trust anyone with your tattoo removal- maximise your results from trained staff at a professional medical skin clinic. Using Fotona’s QX MAX system- the most advanced Q-switched laser on the market today, we are able to reduce the required number of visits to safely remove your tattoo. By reducing the amount of visits we are easing any unnecessary inconveniences and discomfort for you, as well as lowering the overall cost. After your treatment you will receive the very best after care and advice from our friendly team of trained experts. The FOTONA QX MAX, hailing from Slovenia, is built for maximum performance with patented, state-of-the-art innovations to make treatments safer and more effective. Being the most powerful single-pulsed Q-switch Laser it is able to remove a broad spectrum of tattoo colours. FRACTAT is the absolute latest advancement in laser tattoo removal- unique to the Fotona family, and Skin Alert is the only establishment in Cairns that can offer this to you. As well as utilising the Q-switch YAG laser to shatter the ink, there is an additional step prior to this, using a fractionated hand piece to ablate away miniscule columns of skin over the tattoo. This process allows for optimal clearance of the ink, reducing your number of visits and speeding up recovery time. Before laser came along people had little success with removing tattoos, often being left unsatisfied and with scarring. Thankfully, innovations have led to laser being the safest and most successful method to remove unwanted tattoos with minimising scarring. Q-switch Nd:YAG lasers are most commonly used for their high peak-power abilities which allows them to break up the pigment in the skin. Standard treatment is to use a YAG laser to ‘shatter’ the pigment into tiny pieces, which the body then removes via the lymphatics system over a period of weeks. Here at Skin Alert we are proud to use Fotona lasers, and offer you the FRACTAT removal method. With Fractat, before we break up the pigment with the YAG laser, we will use a separate handpiece to ablate microscopic columns of skin away. This additional step allows for the YAG laser to work even better, removing more ink in fewer sessions. Not all tattoos may require this technique, but we will discuss that with you during your consultation. Can all tattoos and tattoo colours be removed? Black, dark blue and red inks are the most responsive. Green, yellow and aqua inks can be more resistant. The colours used in your tattoo will greatly affect how fast your tattoo can be removed, and how much clearance you will get. Brighter colours will require more sessions. Fortunately we have four separate laser hand pieces that we can use to tackle all ink colours. Multiple sessions spaced anywhere from 6-8 weeks apart are required, and are dependent on tattoo type, age, size, location, ink density and the colours of the inks (be aware that some colours may be mixed together and are initially not seen). Due to all of these factors you may need anywhere from 4-10+ sessions. During your initial consultation this will be discussed and a treatment plan will be devised for you. No. 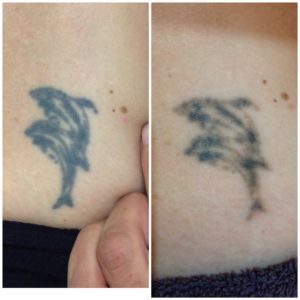 Lasers designed specifically for tattoo removal are the best modality to use to reduce the chance of scarring. They are very safe and effective and are designed to work without harming the skin in any way. Our professionally trained staff hold Queensland Radiation Licences (allowing them to operate lasers in QLD) and stay up-to-date with education, enabling them to perform the safest and most effective laser tattoo removal. When the laser is pulsed into the skin it can feel like a quick snap of a rubber band, it will also make a snapping sound. There is some minor discomfort, but to counteract this we can use either topical numbing cream or ice packs before. Treatment is usually fast, making it tolerable. Some body areas may be more uncomfortable than others, for example bony areas vs. arms or legs. Pricing is dependent on tattoo size, density of ink, colours of ink, and how many sessions you will need. During your initial consultation we will discuss this with you since all cases will be different. Prices for small tattoos start from $100. If you are considering having a tattoo removed and have any additional questions or concerns, please contact us to arrange a complimentary consult with one of our friendly experts.